For a limited time only get 30% off on our latest offer! 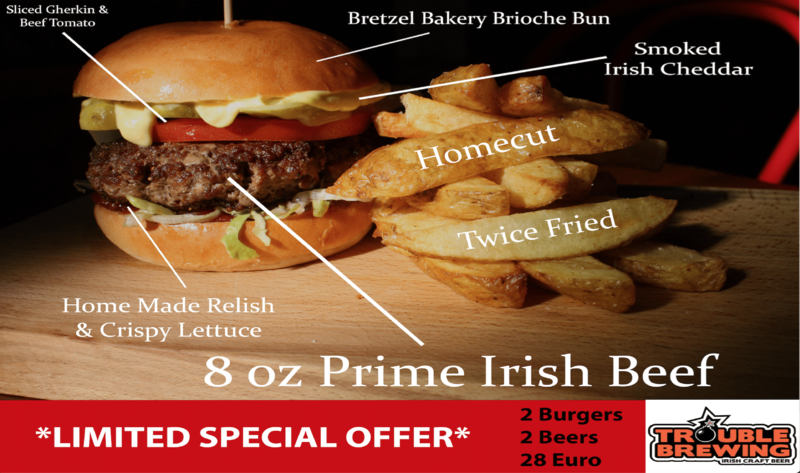 Get two Burgers of your choice and two pints of Trouble Brewing Craft Beer for only €28. Our 8oz 30-day aged beef burger is a popular choice and is served with gherkin, smoked cheddar, tomato, beer mayo, lettuce and home cut fries! Not in the mood for beef? Why not get our delicious Chicken Burger with beer mayo, crispy lettuce, spiced yoghurt and salsa fries or our mouth watering Vegetarian Burger with tzatziki, tomato, salad and cucumber served with a fresh salad.